DENMARK: The acquisition of one of NKT's rivals were the Danish company's main earnings contributor in the first quarter of 2018. NKT's Q1 2018 revenue was up 28.2% year-on-year, rising from €273.8 million to €351.1 million, while there was a 14.6% increase in operating profit (Ebitda), from €17.8 million to €20.4 million. The acquisition of ABB’s high-voltage cable business, which closed in March, contributed €66.1 million and was the "primary growth contributor" during the period, the company said. 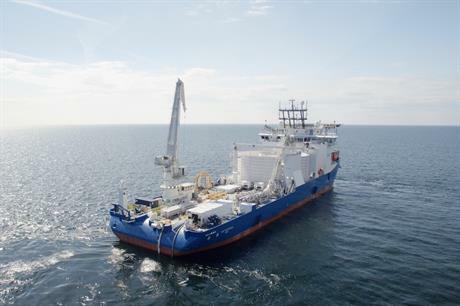 Also in the first quarter, NKT delivered the "first part of the Hornsea One cables" to the site off of England’s east coast ahead of installation, it stated. The project is among the largest in NKT’s current portfolio and will "be a strong revenue contributor" this year, the company added. NKT was not awarded any material orders in Q1 2018. However, it sees the offshore wind market as "generally more stable and with a more predictable route to realisation". NKT maintained its expectations of revenue between €1 billion and €1.1 billion and Ebidta between €90 million and €110 million in 2018, the company added.